The Form8tor® Superflex oven moves PVCu/Vinyl profile bending into a new dimension. The oven utilises Long Wave Infrared heating, which is less colour selective than most ovens on the market. This means when heating any extrusion, light or dark in colour, the heat remains uniform, producing an accurate bend every time, with no waste due to overheated profiles. The oven offers significant energy savings due to its close thermal control and reduces to approximately 50% of its initial working load once it reaches operating temperature. Special laminar airflow provides temperature uniformity for all types of extrusion, thus making operational savings up to 50% compared to conventional systems. The oven offers ease of manual operation with simple to operate controls and unique air-operated door locks that open only when the process is completed. This eliminates any room for operator error which saves both time and money. 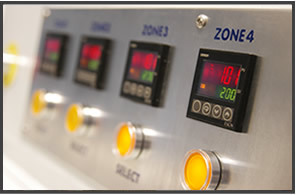 The oven also incorporates four selectable zones to allow for different extrusion lengths up to 4.1m and gives both a visual and audible alarm when the process has timed out. Unlike most top opening systems, the Superflex's 4.1m drawer system, with its rack and pinion mechanism, allows it to be opened effortlessly and safely using just one hand. Equally, the stainless steel oven chamber with all round installation and unique design, provides the correct airflow for heat dispersal. Long life elements and robustly designed parts also ensure that the oven is virtually maintenance free. For more information on the packages available click here.